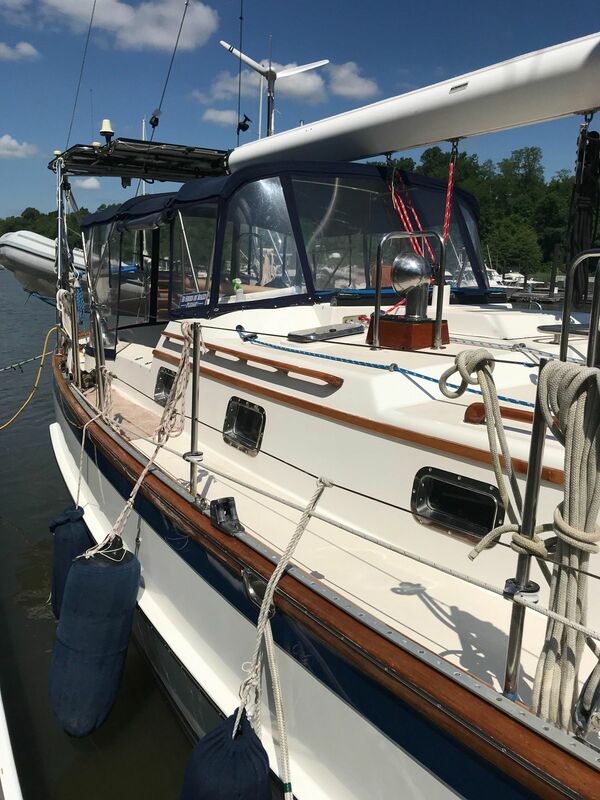 SOME BOATS LOOK AS OLD AND TIRED AS THEIR AGING OWNERS DO BUT NOT THIS ABSOLUTELY BEAUTIFUL YOUNG WORLD CRUISER, FOR THIS YACHT IS YOUNG REGARDLESS OF HER AGE BECAUSE SHE WAS EXERCISED/FED, LOVED AND CARED FOR PROPERLY REGARDLESS OF THE TIME AND MONEY THAT IT TOOK. 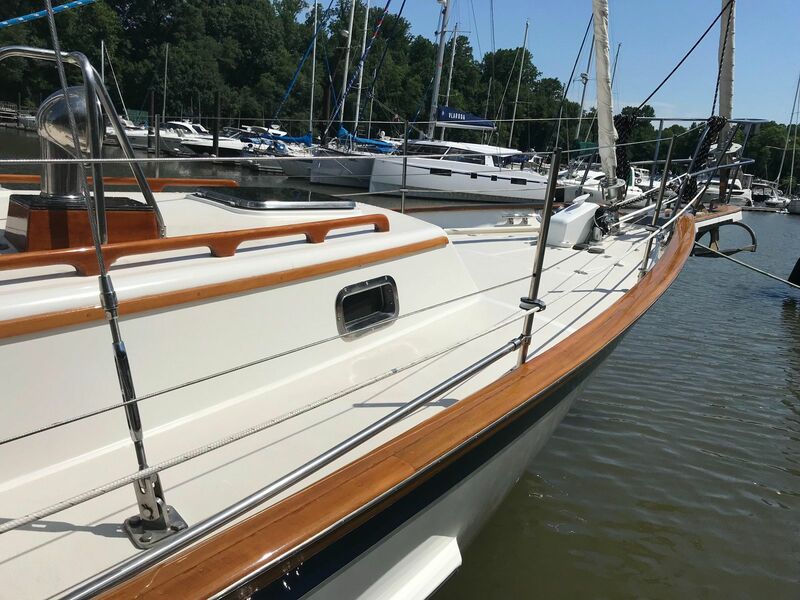 THIS PERFECT EXAMPLE OF A HIGH CALIBER DESIGNED AND BUILT, SAFE AND COMFORTABLE WORLD CRUISER IS TURN KEY READY TO GO NOW, ALL IN 100% YACHT CONDITION. SHE'S AS WELL PRESERVED AS A CLASSY BEAUTIFUL FIT MIDDLE AGED WOMAN THAT DOESN'T LOOK OR ACT HER AGE. SHE WILL NOT DISAPPOINT........SELLERS ARE "THINKING" ABOUT MOVING TO POWER. We are very pleased to present this beautiful and well maintained Cabo Rico 45 to the brokerage market. Kalista, as she is called, is a gem. 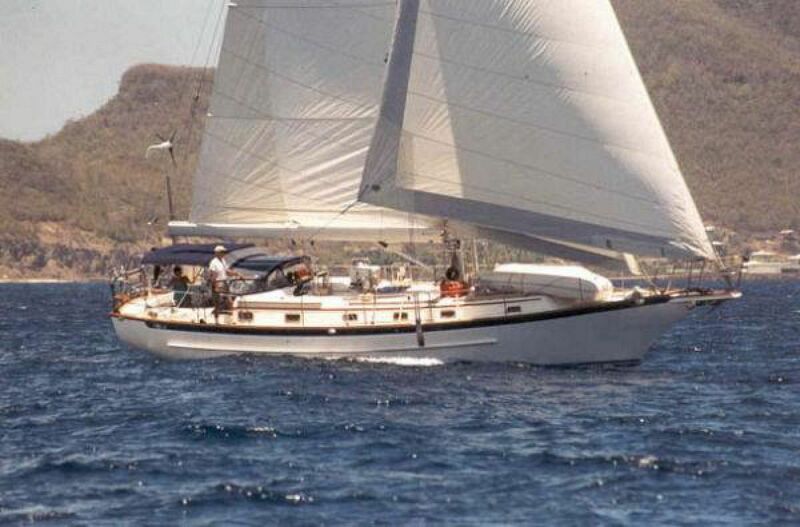 She is beautiful, well equipped, totally comfortable cruising yacht that you would be very proud to own. 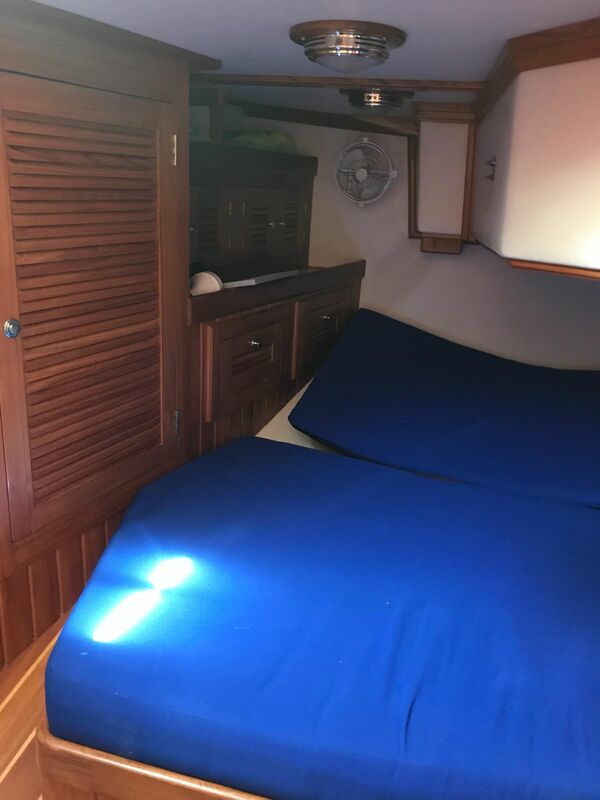 With two gorgeous staterooms and two heads she is perfect for a couple with room for friends and family to join in the fun. With her full keel and 5’6” draft she is ideal in the Bay and Bahamas and safe to cross oceans and venture far! 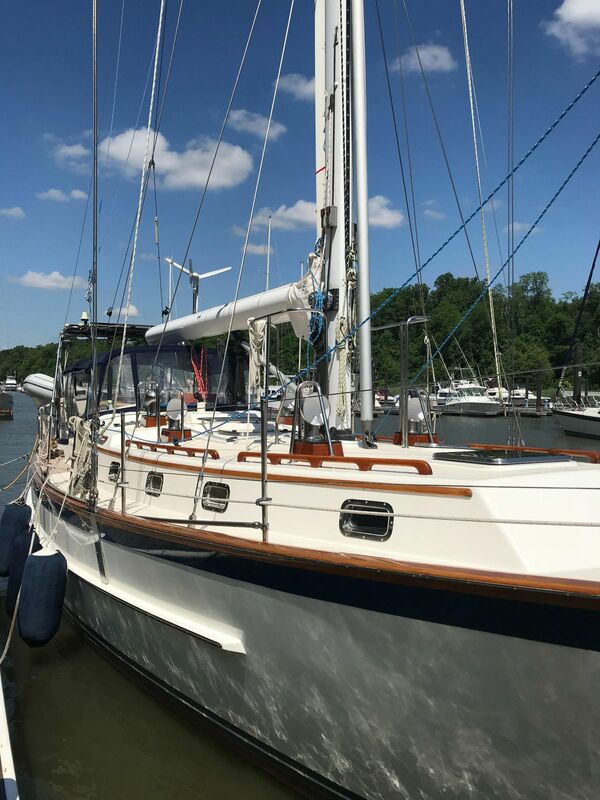 With her cutter rig and divided sail plan and of course all the mechanical advantages of in-boom furling and power winches she is so easy to sail. Her displacement of just over 35K lbs and ballast of 13,500 lbs makes her comfortable and stable with sail area to drive her easily. The Cabo Rico 45 is a great boat. There really are not a great number of really wonderful blue water sailboats and this Cabo Rico 45 is one of them. She’s a pedigreed design by William Crealock built in Costa Rica by CR Marine which started with the Cabo Rico 38 in 1977. Cabo Rico, CR Marine is recognized for their continuous production of Cabo Rico since those great days of ocean going sailboats. The same family of highly skilled and dedicated craftsmen have been building these boats by hand for over 40 years. All the parts are sourced in the US except the famous Cabo Rico Teak grown especially for the factory. CR Marine is still in business building power yachts as well as sailboats. The build quality is robust and seaworther. The workmanship is excellent. The boat is built for the demands of the sea. Cabo Rico is surely among the very best blue water boats! The Cabo Rico 45 is particularly idea for a cruising couple. This is a very special offering indeed! 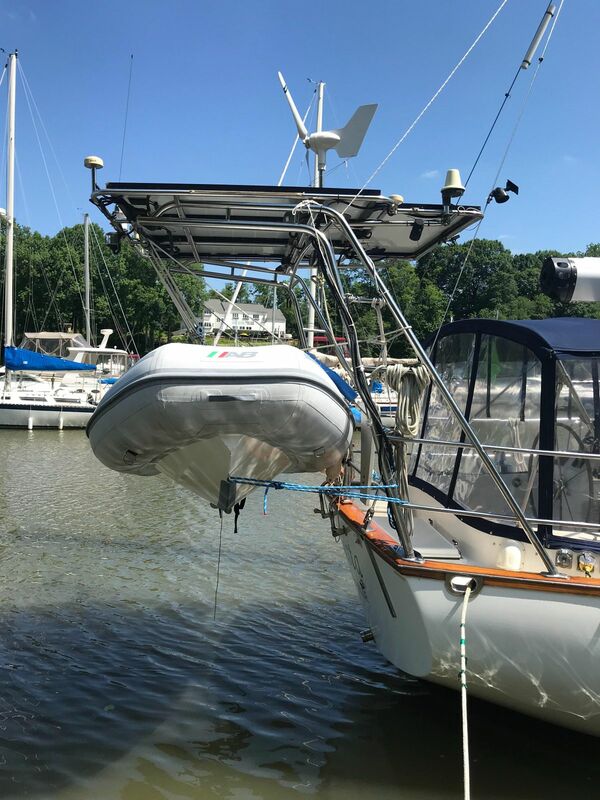 Kalista is a 2001 Cabo Rico 45 originally built by CR Marine for a very experienced sailor who knew exactly what he wanted. It took three years to build the boat. 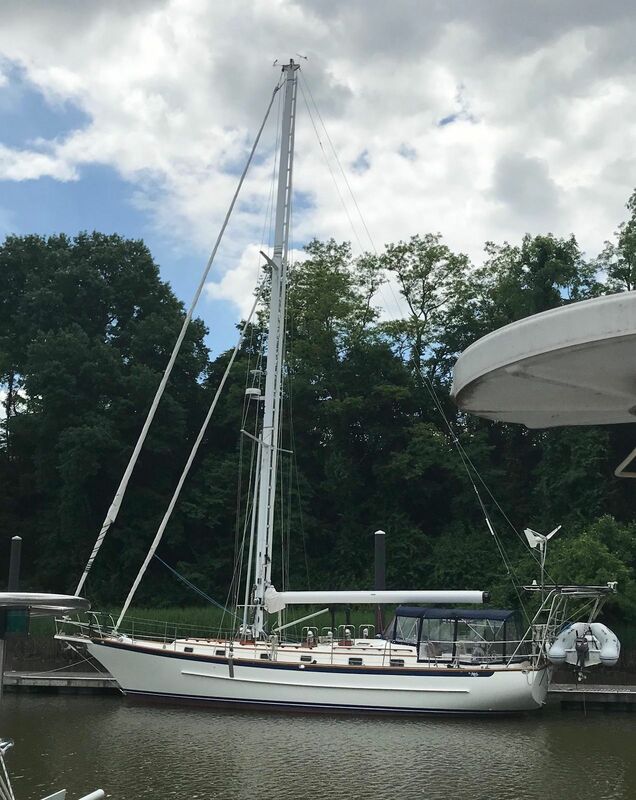 This lifetime sailor was building his dream boat and knowing this was the last sailboat he got everything he had ever dreamed of including in-boom furling mainsail, furling headsails, electric winches, water maker, bow thruster, solid ground tackle and windlass, Espar diesel heat, entertainment systems, and top of the line electronics and communications. And inside she is gorgeous….I mean really really beautiful. 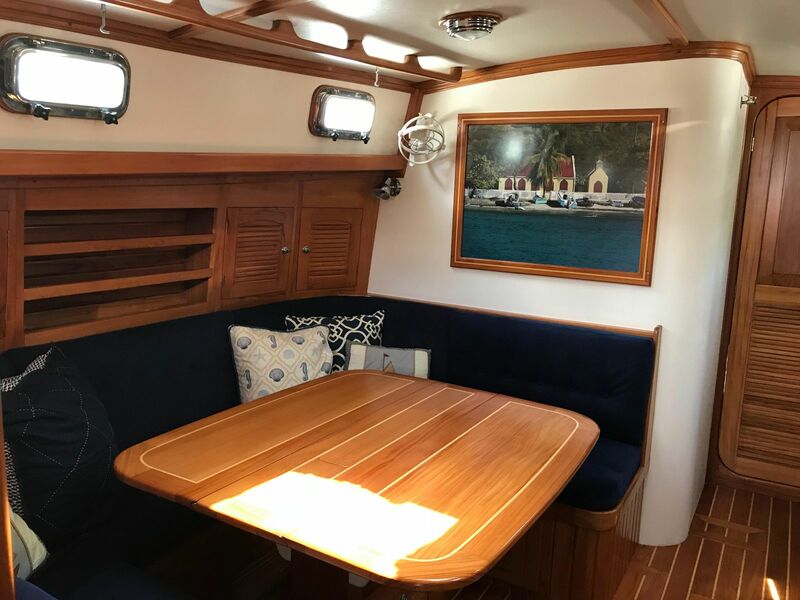 She has a special interior with a Herreshoff white and varnished teak. She is light and bright inside and really rare and special. 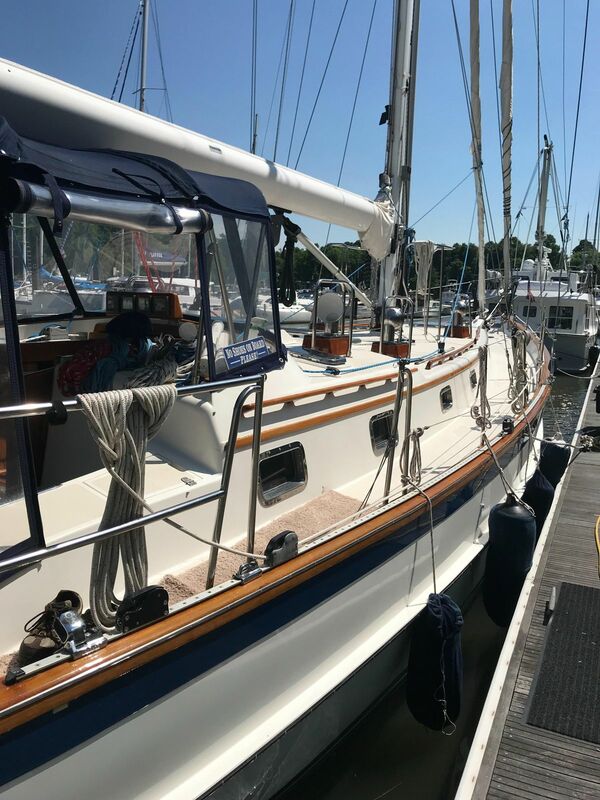 Kalista took so long to build that she was not even launched until 2007 and her first owners took her to the Bahamas and then just one trip to the Caribbean, back to Bermuda and home to Annapolis. Her second owner was a lucky sailor too. And he has maintained her and cared for her as the piece of art that she is. Kalista is special with many custom features and every comfort. It is quite wonderful that the custom dinette converts to a huge double berth so that you can sleep seven in comfort if you want. 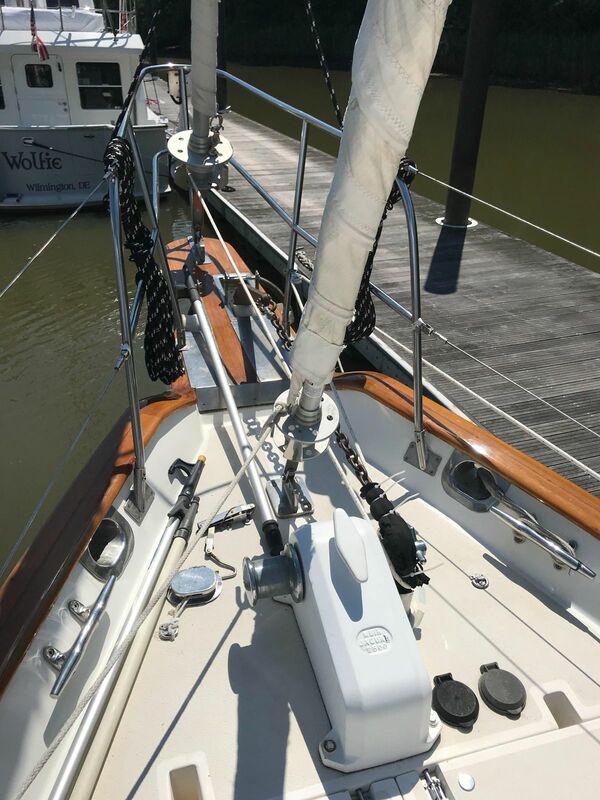 Mast height at 63’ is ICW compatible! 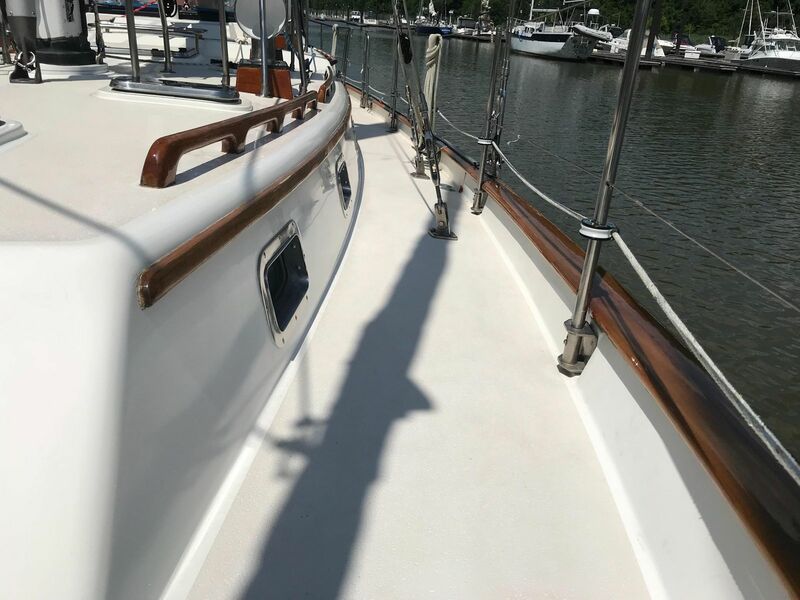 This boat is easy to sail, safe and comfortable; elegant beyond your dreams she is a cruising yacht of the highest caliber! With her pedigree of Cabo Rico and the care she has had, she is an absolutely beautiful yacht for the most discriminating blue water enthusiast. 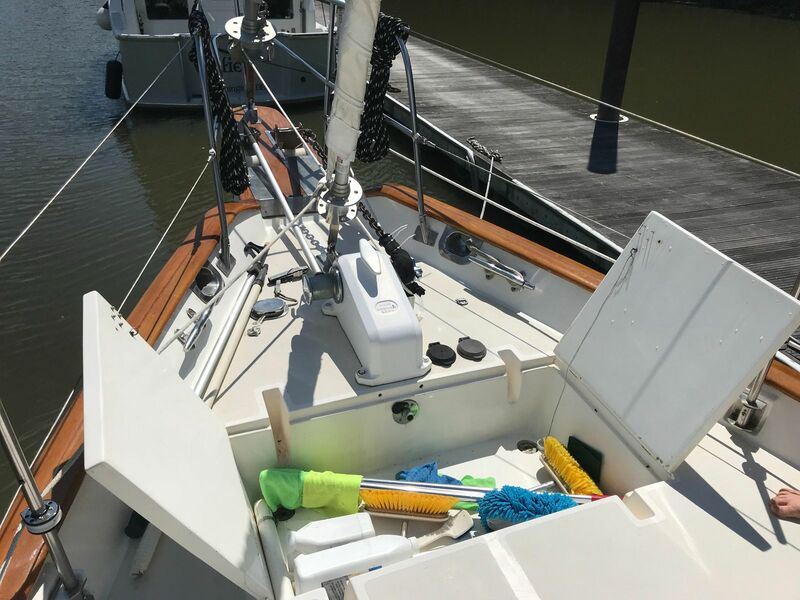 If you are looking for a high caliber cruising sailboat you may have just found her. Kalista will not disappoint. Call now before someone buys her. 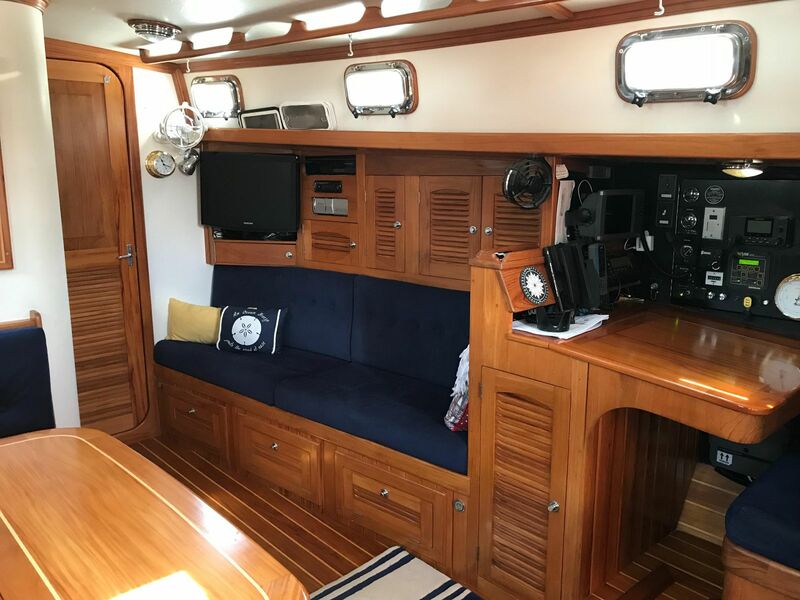 The Cabo Rico 45 is a blue water boat designed with headroom of about 6’5” in the salon, two beautiful staterooms, two heads, shall shower in the master, huge galley, comfortable salon, and loads of storage. 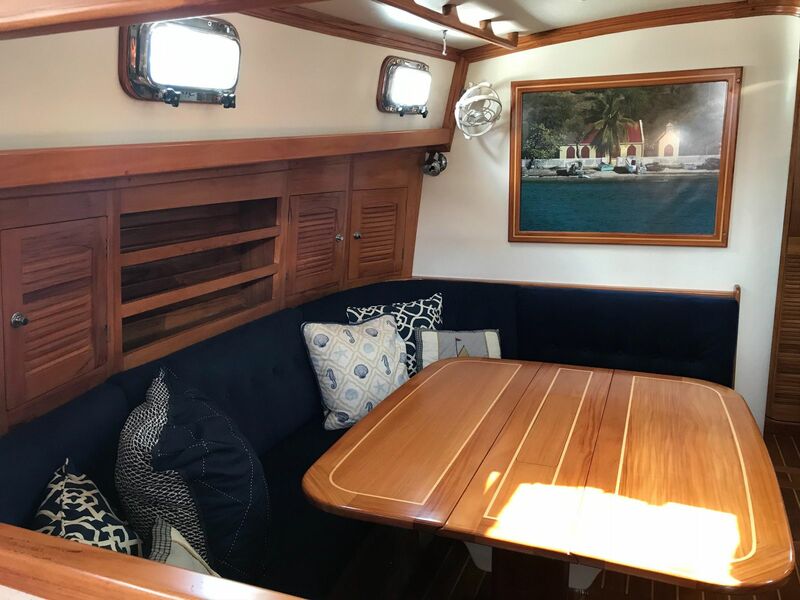 The famous Cabo Rico teak interior and sumptuous joinery with all the custom features is simply elegant. 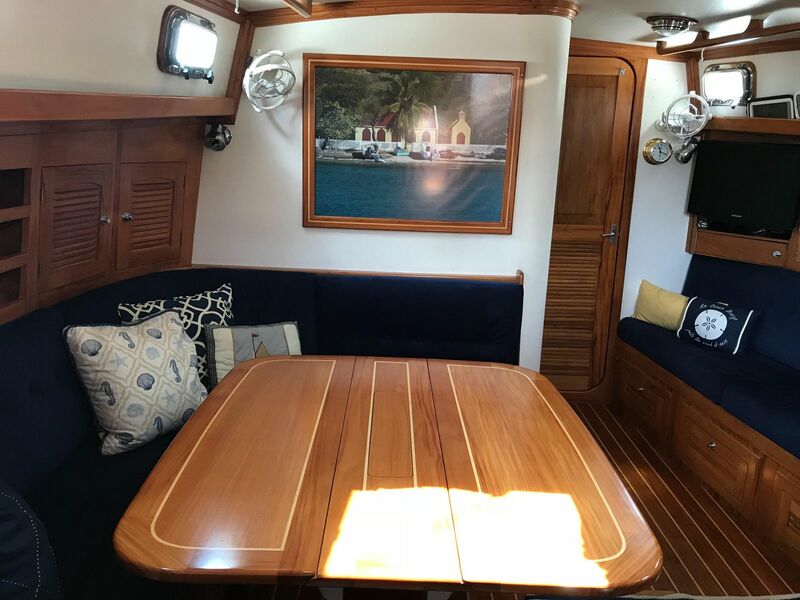 Many Cabo Rico are all teak below but Kalista has the bright and airy Herreshoff interior with white Formica and plenty of varnished teak. She is a beautiful yacht. The headliner is light creamy fight resistant material with teak battens. The opening stainless steel portlights and overhead stainless steel deck hatches provide wonderful light and ventilation. The original CR 45 layout is traditional and beautiful and it totally works. 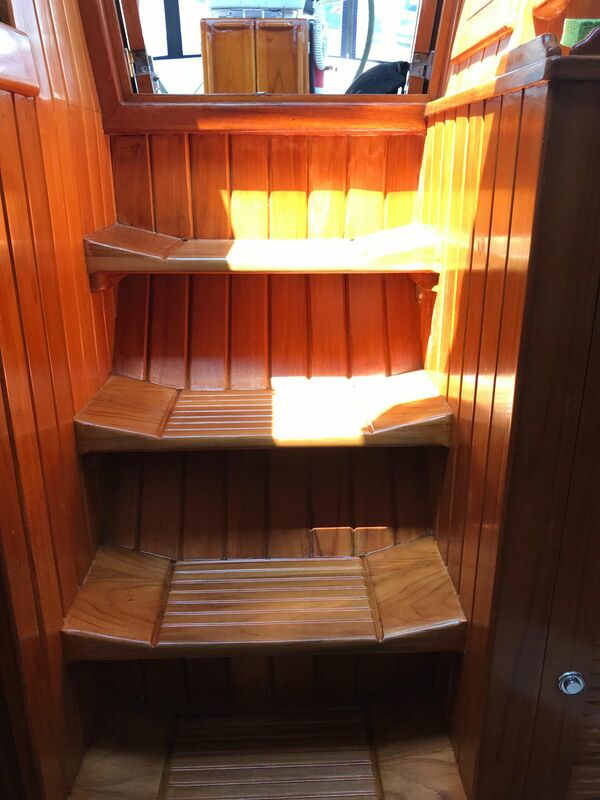 The vessel is bright and well ventilated with beautiful built in teak furniture and a traditional teak and holly cabin sole. 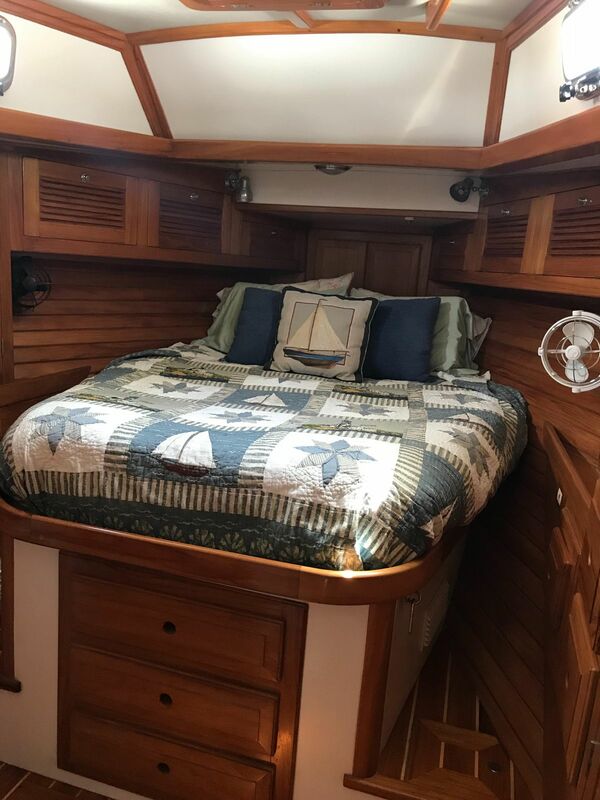 Starting forward the chain locker is in the bow with the master stateroom with the very sought after island queen berth and ensuite head and stall shower. There is an overhead hatch for ventilation as well as two opening ports. 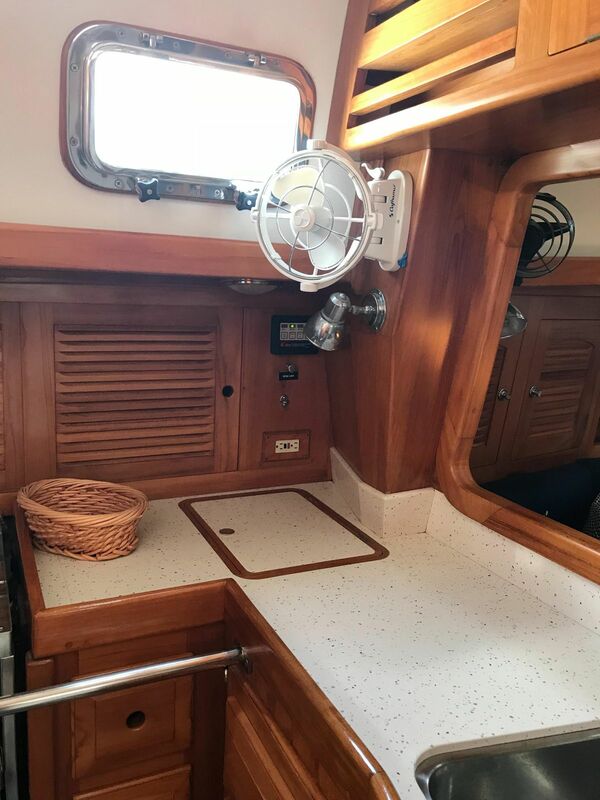 There are cabinets outboard port and starboard as well as two lockers port and starboard cedar lined with lights provide stowage as well as storage underneath the berth and drawers. The ensuite head is large head with a separate stall shower. The head is largely white Formica for ease of cleaning with Corian vanity top and has a large teak cabinet and mirror. The main salon just aft of the main bulkhead sumptuous with a solid dining table and U shaped settee to port. The large teak table has with built in liquor storage in the center. The dining area converts to a double berth to sleep a total of seven if you bring the family. The straight settee to starboard has a lee cloth to provide a secure sea berth. The elegant cabinetry outboard of the settees provide nice storage. There is well ventilated storage under the berths as well as behind. All the space is accessible for good storage. 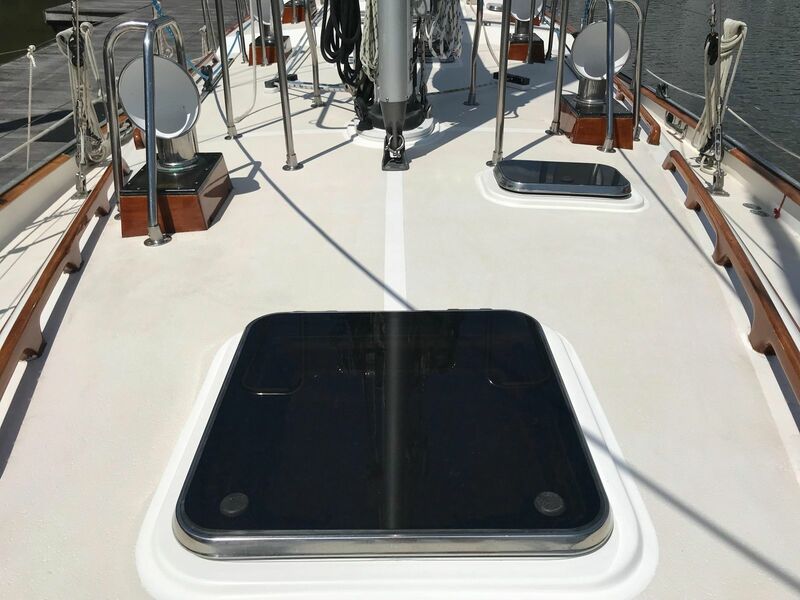 Several stainless steel opening hatches with screens provide excellent ventilation and there are of course many opening ports and three Calframo fans. There are even dimmers to set the mood lighting and the courtesy lights are really nice also. The ambiance is lovely and pleasing. 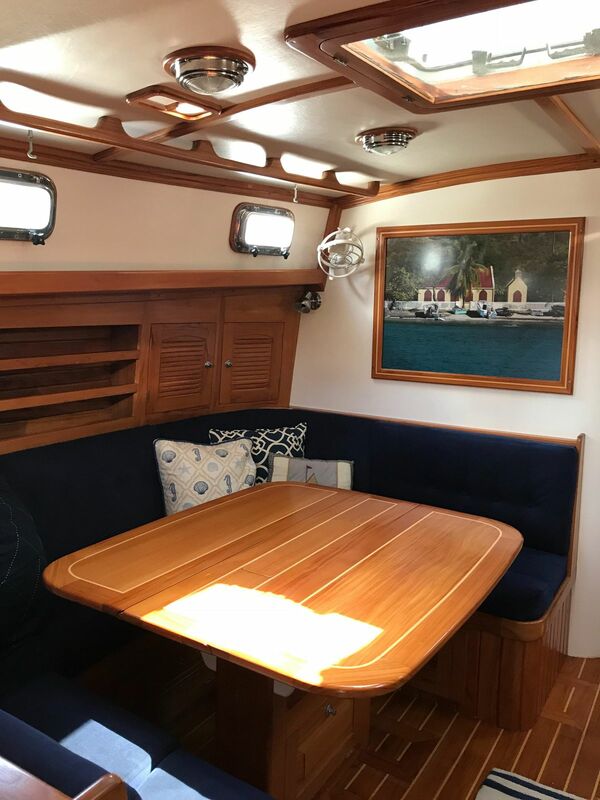 The guest cabin aft to port is a complete private cabin with a teak louvered door. There is a hanging locker and cabinetry. It’s a nice private guest cabin and it makes a wonderful sea berth on a passage. The aft head has red and white dome lights and a hatch on opening port for ventilation. It has a standard marine head, Y valve and a sink/shower and teak grate. The Nav station is just aft of the salon to starboard adjacent the galley. 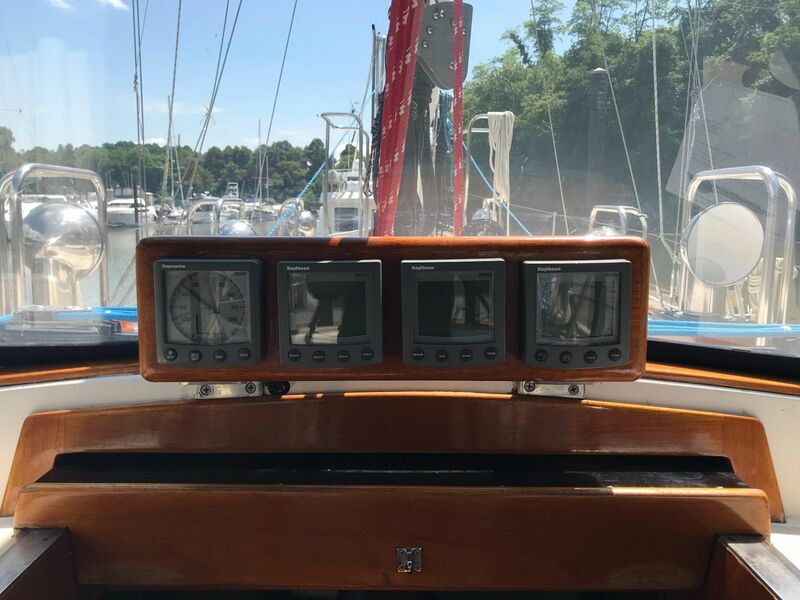 The nav station is a classic sit down forward facing Nav station with a chart table with storage outboard and a cabinet below as well as the chart table itself. 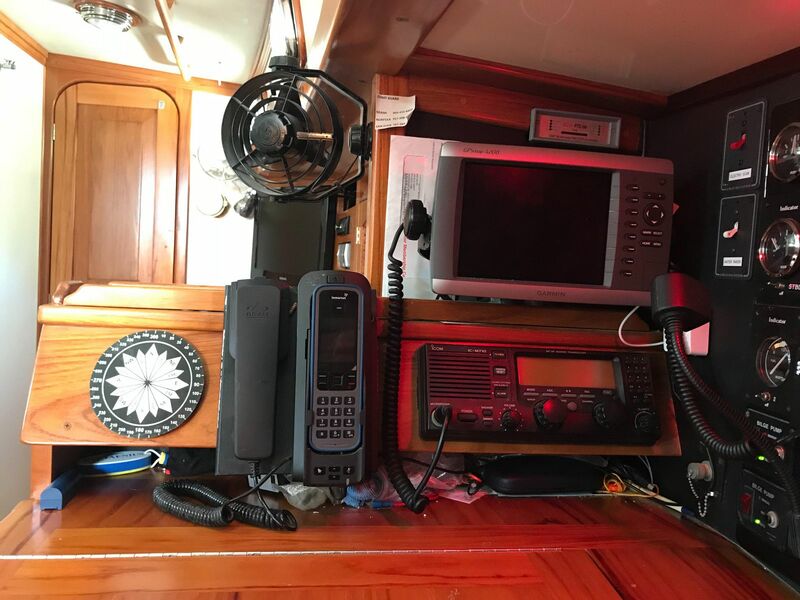 It is a proper Nav station and ships office with the electrical breaker panel and all the electronics including Radar, Chart plotter, VHF radio and Icom single side band radio. The Cabo Rico galley is opposite the nav station on the port side. It is a very, very nice and secure galley that you will enjoy at anchor and at sea. There is everything including the refrigerator with top and side opening, the freezer, propane stove and oven and also a microwave. There is ample counter space and good stowage. It is lovely Corian! It is a large u-shaped galley with an opening port and overhead hatch as well as a fan. 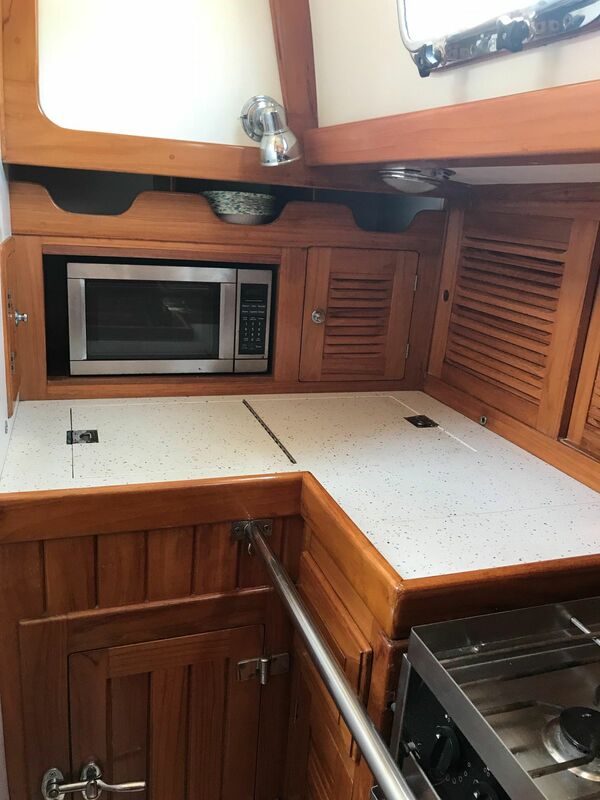 Kalista has the additional galley cabinet over the refrigerator/freezer between the salon and the galley which is great storage. 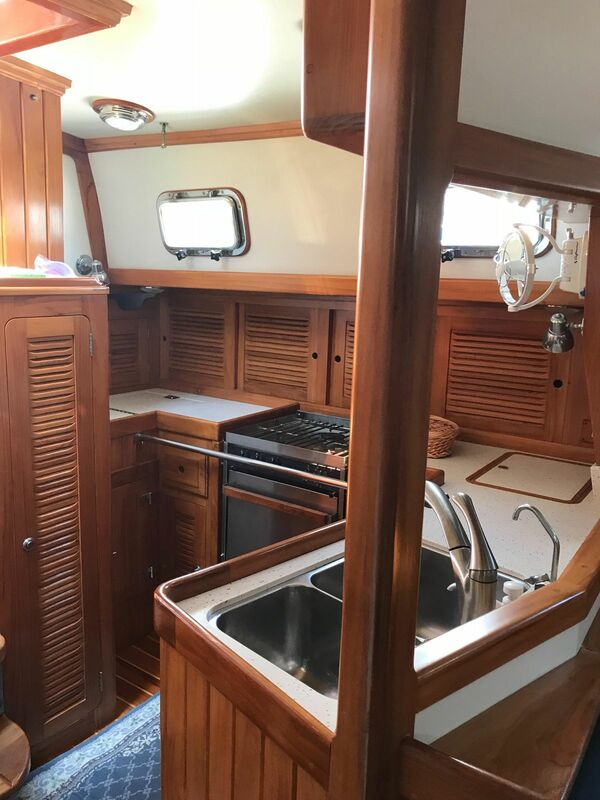 With the storage outboard of the stove and also the deep storage under the counter at the bulkhead outboard of the double sinks, there is a tremendous amount of galley storage. The engine room is under the cockpit behind the companionway with pretty good access. 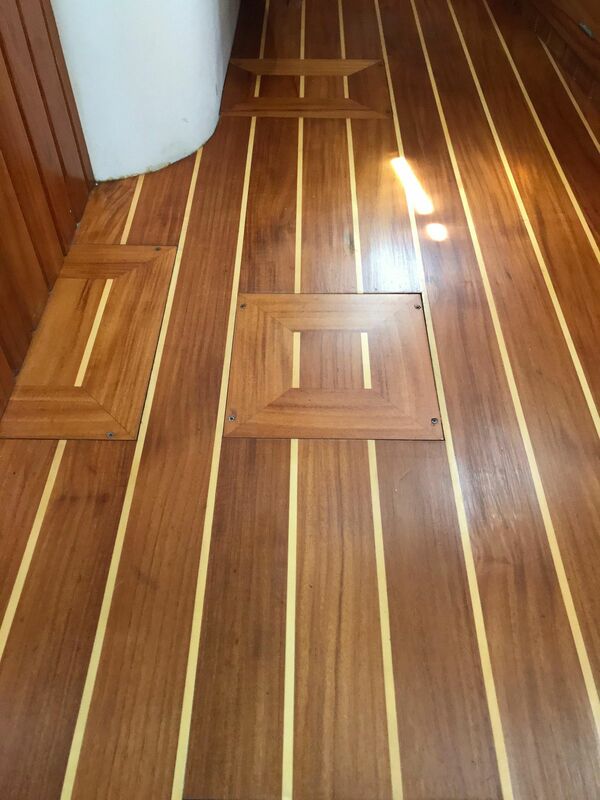 The companionway stairs are removable for access to the large engine room. Manuals for all the systems! Complete 12 volt electrical system with, Kyocera solar panels, Wind generator and low amp lights. Beautiful forward facing sit down nav station with chart table and complete ships office.